^ 例えば、 Fausto Cercignani, Shakespeare's Works and Elizabethan Pronunciation, Oxford, University Press (Clarendon Press), 1981. ISBN 978-0198119371. ^ Honan, Park. Shakespeare: A Life. Oxford: Oxford University Press, 1999, p. 43. ^ E. A. J. Honigmann, "Shakespeare: The Lost Years" Manchester University Press; 2nd edition, 1999, p. 1. ^ a b c "The Lost Years", Shakespeare Timeline. ^ William Allan Neilson and Ashley Horace Thorndike, "The Facts About Shakespeare", The Macmillan Company, 1913. ^ Stephen Greenblatt, "Will in the World", Quebecor World, Fairfield, United States, 2004. ^ e-notes.com on Shakespeare's Globe Theatre, Shakespeare at e-notes. 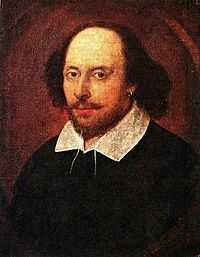 ^ Article on Shakespeare's Globe Theater Zee News on Shakespeare, accessed Jan. 23, 2007. ^ Jonnie Patricia Mobley, William Shakespeare, "Manual for Hamlet: Access to Shakespeare", Lorenz Educational Publishers, 1996, p. 5. ^ Graham Holderness, "Cultural Shakespeare: Essays in the Shakespeare Myth" University of Hertfordshire Press, 2001, pp. 152-54. ^ Leon Harold Craig, Of Philosophers and Kings: Political Philosophy in Shakespeare's "Macbeth" and "King Lear" University of Toronto Press, 2003, p. 3. ^ G. K. Hunter, "English Drama 1586-1642: The Age of Shakespeare". Oxford: Clarendon Press, 1997, 494-496. ^ Patrick Murphy, "The Tempest: Critical Essays", Routledge, 2001. ^ Richard Dutton, "The Birth of the Author," in Cedric Brown and Arthur Marotti, eds, "Texts and Cultural Change in Early Modern England" (London: Macmillan, 1997): p. 161. ^ Fredson Bowers, "On Editing Shakespeare and the Elizabethan Dramatists". Philadelphia: University of Pennsylvania Press, 1955, p.8-10. ^ Alfred W. Pollard, "Shakespeare Quartos and Folios". London: Metheun, 1909, xi. ^ Gary Taylor and Michael Warren, "The Division of the Kingdoms". Oxford: Clarendon Press. 1983.